Centre for Strategy and Leadership (CSL) successfully conducted the workshop “Andhra Pradesh: India’s Sports Capital for Next Gen Champions” at Vigyan Bhawan, New Delhi. This was the second workshop of a nine-part series “Andhra ka Vikas Desh ka Vikas”. Andhra Pradesh is building a world-class Sports City within its upcoming new capital Amaravati with the vision to host India’s first Olympic Games. Amaravati is a city of 9 cities, each focussed on a particular theme, such as Sports. “Amaravati, the capital city of the future by the Andhra Pradesh government, under the leadership of Chief Minister Chandrababu Naidu is a symbol of sustainable inclusive growth. The futuristic capital is based on land pooling rather than land acquisition, clearly exemplifying the enthusiasm and support from the people of Andhra Pradesh in building this world-class capital. 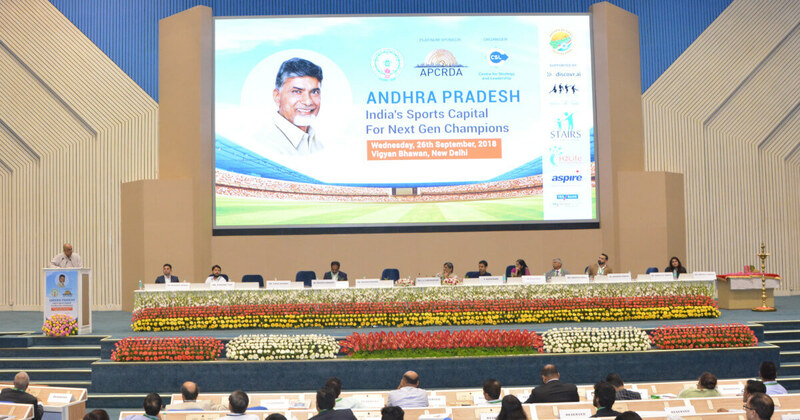 Moreover, Andhra Pradesh government has come out with an exhaustive sports policy which will take the sports to the new level,” said Mr. Praveen Prakash, Resident Commissioner, Andhra Pradesh Government. Ms. Bhavna Saxena, IPS, OSD, Economic Development Board, Government of Andhra Pradesh; Mr. Mustafa Ghouse, CEO, JSW Sports; Mr. Siddhartha Upadhyay, Founder & Secretary General, STAIRS, and, Governing Body Member of Sports Authority of India (SAI); Mr. Kishore Taid, Co-founder and CEO, Bhaichung Bhutia Football Schools, and Founding Trustee, Indian Football Foundation; Mr. Rakesh Kohli, Chairman, Stag Sports, and Member, Governing Council, Sports Skill Council, and, Ms. Kanthi D. Suresh, Editor in Chief, Power Sportz Tv were also present.